development. Applications must reach us no later than 4pm on 17 May 2019. Preference will be given to those students who: are in their last year or second to last year of study toward their degree; have proven academic merit; demonstrate a commitment to tikanga Māori and te reo Māori; demonstrate a commitment to community; and are interested in building skills and expertise to support Māori economic and social development. It is envisaged that the recipients of this scholarship will be committed to the future economic and social development of Uenuku, Tamakana and Tamahaki iwi, hapū and whānau. 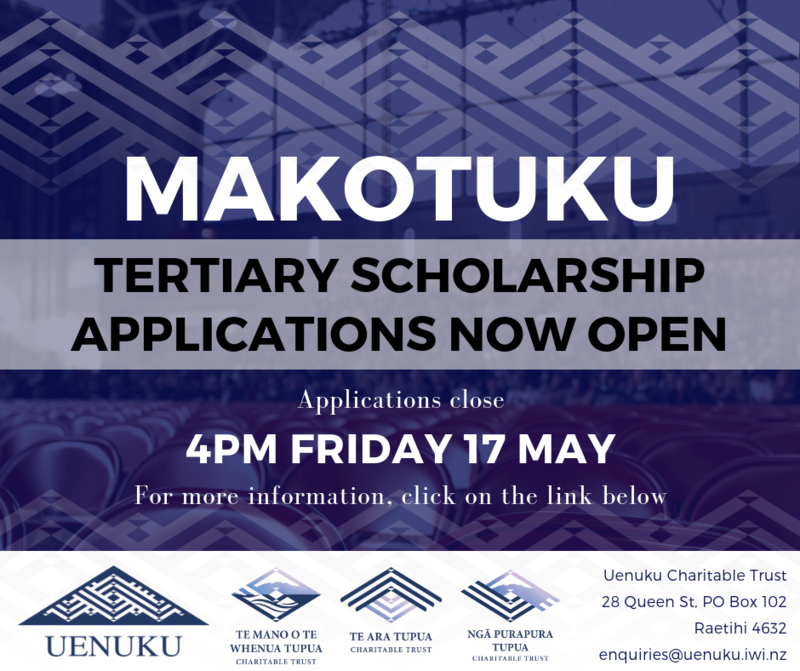 The Makotuku Scholarship has been established by Uenuku Charitable Trust in partnership with international investment advisory firm Pure Capital Ltd.
Makotuku Scholarship 2019 application form.